One complicated question is preventing all parties from cleaning up Cement Creek, one of the state’s most polluted waterways: Who will pay for it? According to Bill Simon, a co-coordinator of the Animas River Stakeholders Group, an organization that has tried since 1994 to ensure the Animas River’s water quality, the science behind the cleanup is comparatively simple: A limestone water-treatment plant would do the trick. The catch with this technology, he said, is that it’s expensive. The U.S. Environmental Protection Agency estimates it would cost between $12 million to $17 million to build and $1 million a year to run – in perpetuity. Sunnyside Gold Corp. was the last mining company to operate in Silverton. Bought in 2003 by Kinross Gold Corp., an international mining conglomerate that generated billions in revenue last year, Sunnyside denies all liability for cleaning up Cement Creek. Sunnyside officials argue the state released it from liability in an agreement that partly depended on its building the American Tunnel bulkheads. These are the same bulkheads that, according to government scientists, are causing unprecedented amounts of metal to leak from mines higher up the mountain and flow into Cement Creek. The toxic cargo in turn flows into the Animas River. Larry Perino, Sunnyside’s representative in Silverton, said the company has offered the EPA a $6.5 million settlement – an offer the EPA is mulling. In return for the money, Perino said Sunnyside is merely asking the EPA to reiterate that it is not liable for all damage going forward. “I think it’s only fair,” Perino said. Perino said Sunnyside is a responsible company that has won national awards for its reclamation efforts. “We don’t want to be the answer to the problem, but we want to be part of the solution,” he said, citing Sunnyside’s fruitful collaboration with the Animas River Stakeholders Group to improve water quality elsewhere in Silverton. Peter Butler, a stakeholders group co-coordinator and chairman of the Colorado Water Quality Control Commission, praised Sunnyside as an excellent partner. “They’ve always been honest about the science,” he said. But Butler agreed that from a game theorist’s perspective, Sunnyside is enjoying its best-case scenario: It is much better to be a mining corporation that gives $6.5 million working toward river cleanup than to be held liable for great environmental damage and forced to pay at least $20 million in compensation. If Sunnyside wants the EPA to release it from liability, at $6.5 million the EPA probably isn’t biting. “$6.5 million is a starting point,” said Mike Holmes, the EPA’s Denver-based remedial project manager for Region 8, which includes Silverton. The EPA could turn to the Superfund, a designation that gives the agency broad powers to clean up sites contaminated with hazardous substances and force responsible parties to pay for the cleanup. Perino said Sunnyside vehemently opposes Cement Creek becoming a Superfund site, noting the people of Silverton oppose it, and that the designation likely would undermine Silverton’s economy and Sunnyside’s collaborative work with the Animas River Stakeholders. Peggy Linn, the EPA’s Region 8 community involvement coordinator, said if Silverton would support the EPA designating upper Cement Creek a Superfund site, making it easier for Colorado Gov. John Hickenlooper to sign off on the designation, the agency might have a limestone water-treatment plant up and running within five years. Though five years out, this may prove the quickest solution. The EPA’s Holmes said the agency is increasingly alarmed by the metal pollution flowing from Silverton’s draining mines into Cement Creek. 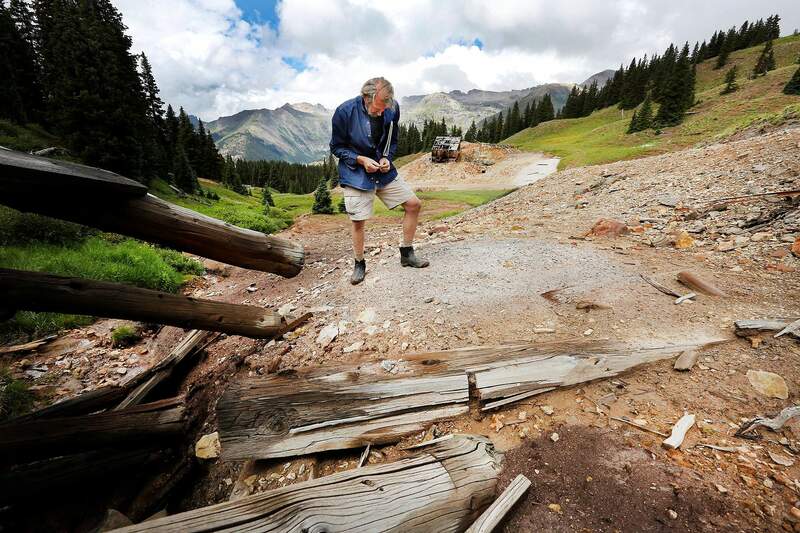 But he said without Silverton’s support, the EPA has few options other than working with Sunnyside through the stakeholders group, an organization that many in Silverton describe as Cement Creek’s best hope. Since its founding in 1994, the stakeholders have sought to ensure the Animas River meets standards for water quality set out in the Clean Water Act. The group has held together despite being informally constituted and with members frequently immersed in bitter litigation – often against other stakeholders. 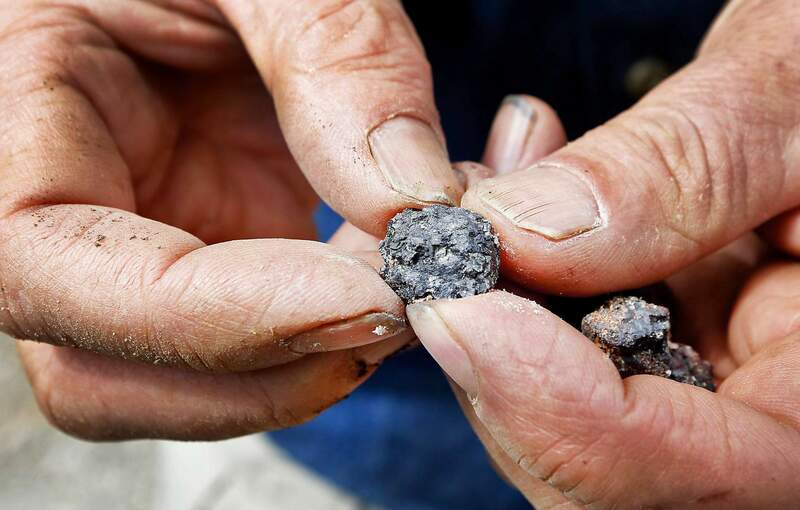 Butler said the stakeholders group and its members have assessed 200 mining sites in Silverton and completed about 60 minor remediation projects – work it has accomplished collaboratively and for which it has won national awards. San Juan County Commissioner Peter McKay said the group has managed to keep warring factions at the table with its mantra of solutions, not blame, and with the high value it places on dry, apolitical and unimpeachable science. And using about $8 million from government grants and in-kind donations, the group has managed significant environmental progress, including the cleanup of Mineral Creek. It has also lobbied U.S. Sen. Mark Udall and U.S. Rep. Scott Tipton to push Congress for good Samaritan legislation. This would protect “vigilante” environmentalists from taking on liability for the sites they try to reclaim. During Animas River Stakeholders meetings, there is a lot more talk about exciting emerging technologies that might address the mine drainage into Cement Creek cheaply than there is hot talk about holding Sunnyside’s feet to the fire. 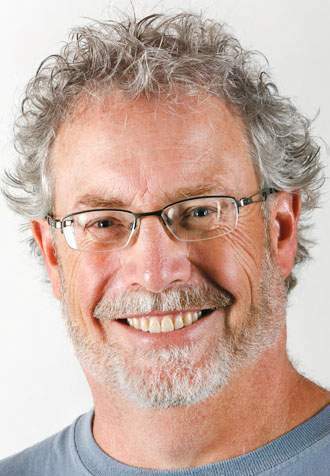 An exception is Todd Hennis, owner of the Gold King Mine, who places the blame on Sunnyside and who is frustrated by others’ complacency on the subject. Metals draining out of Gold King Mine have increased tremendously since Sunnyside placed bulkheads into the American Tunnel. During a recent stakeholders meeting in Silverton Town Hall, Hennis lambasted the environmental record of Kinross Gold Corp., the mining conglomerate that owns Sunnyside. He said the only solution was for Sunnyside to remove the bulkheads from American Tunnel and pay for Cement Creek’s cleanup. Hennis, Butler and Simon agree that Cement Creek is an environmentally urgent, if practically intransigent, problem. If neither Silverton’s attitudes nor Sunnyside’s position change, the Stakeholders Group seems poised to fail in its mission. 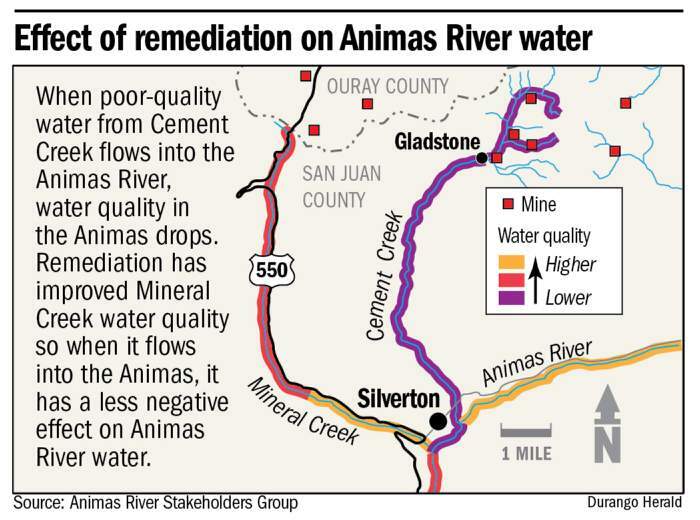 There is a lot of discussion in Silverton and at Animas River Stakeholders meetings about emerging technologies that might treat the metals poisoning Cement Creek. San Juan County Commissioner Peter McKay said he was encouraged by a new technology that would allow the stakeholders to line the riverbed with limestone powder that might naturally make the water less acidic. Within the next few months, the stakeholders hope to put together a $45,000 prize for innovative solutions to the mine drainage through an online brainstorming facilitator. Given the dogged optimism needed for metal mining, it perhaps shouldn’t be surprising that many people in Silverton, ever rugged, seem inclined to double down, waiting and hoping that their grim environmental problem will be solved shortly by the discovery of a miracle technology. But just as Cement Creek burgeons into the Animas, the politics surrounding the problem will also flow downriver, to La Plata County and the city of Durango, where there is not a strong connection to the legacy of metal mining. La Plata County Commissioner Gwen Lachelt said she believes the commission will likely visit the issue. The questions are many. In the meantime, Sunnyside’s $6.5 million offer to the EPA isn’t enough to pay for the technology that would certainly do it – a limestone water-treatment plant. And around Silverton’s mines, the earth, that cannot heal, continues to bleed metals into the Animas. This area below the San Antonio Mine near Red Mountain Pass was remediated several years ago. 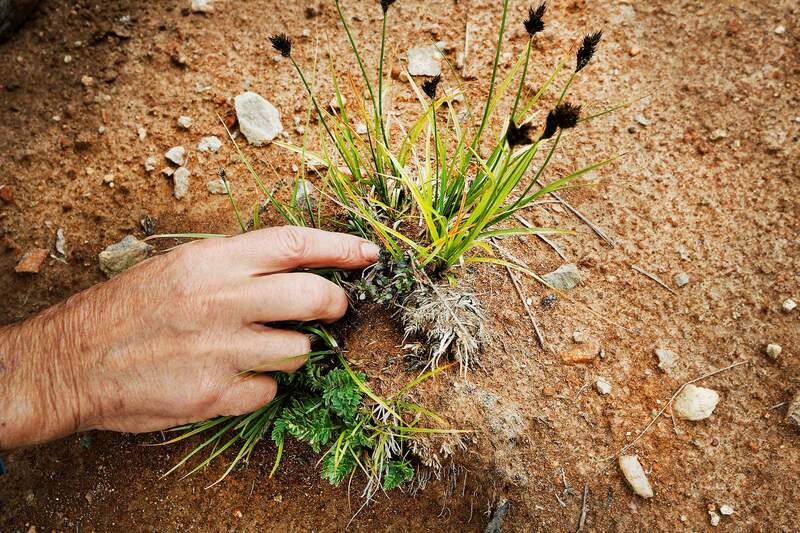 Bill Simon, a co-coordinator of the Animas River Stakeholders Group, collects soil samples to see why some plants aren’t growing in certain areas. Congress Mine is behind him. TODAY: Possible solutions and who might pay. Also, successes in cleaning up mines in the Mineral Creek drainage. Tuesday: Silverton’s mining history lures tourists. Faced with a difficult environmental challenge, residents talk about bringing the industry back after a 22-year absence. Bill Simon, a co-coordinator of the Animas River Stakeholders Group, analyzes soils and plants in a reclaimed area below the San Antonio Mine in the Mineral Creek drainage. He is trying to understand why plants are growing in some areas and not in others. 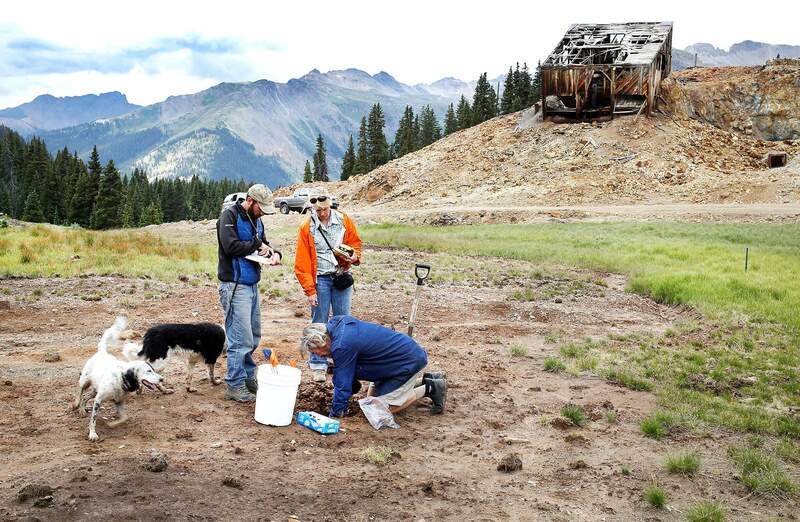 From left, Chris Peltz, scientist with Research Services, Kirsten Brown, with the Colorado Division of Reclamation, Mining and Safety, and Bill Simon, a co-coordinator of the Animas River Stakeholders Group, take soil samples below the Congress Mine near Red Mountain Pass. The area in the Mineral Creek drainage was reclaimed several years ago. 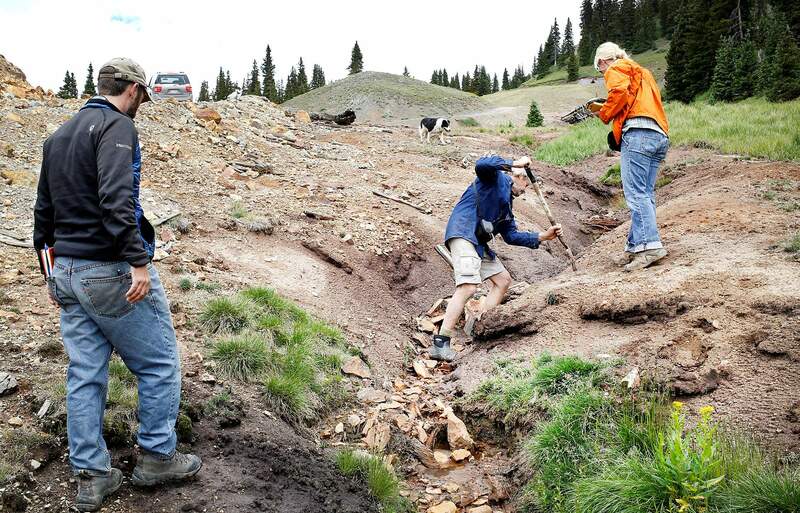 Contractors for the Environmental Protection Agency work to contain the flow of contaminated water into a single pipe that flows out of the Red and Bonita Mine north of Silverton. The water flow will be directed to sedimentation ponds. At far right is an iron fen that was killed because of the mine and a mill. 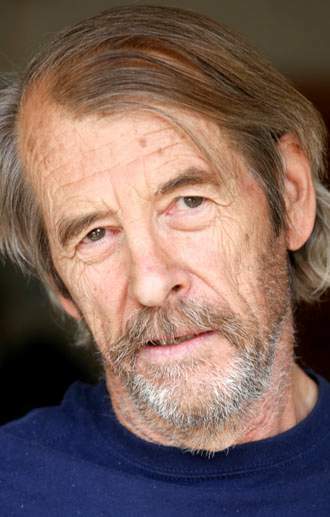 The fen could be restored if it had quality water, according to Bill Simon. From left, Chris Peltz, scientist with Research Services, Kirsten Brown, with the Colorado Division of Reclamation, Mining and Safety, and Bill Simon, a co-coordinator of the Animas River Stakeholders Group, work below the San Antonio Mine near Red Mountain Pass. The group was in the reclaimed area to collect soil and plant samples. 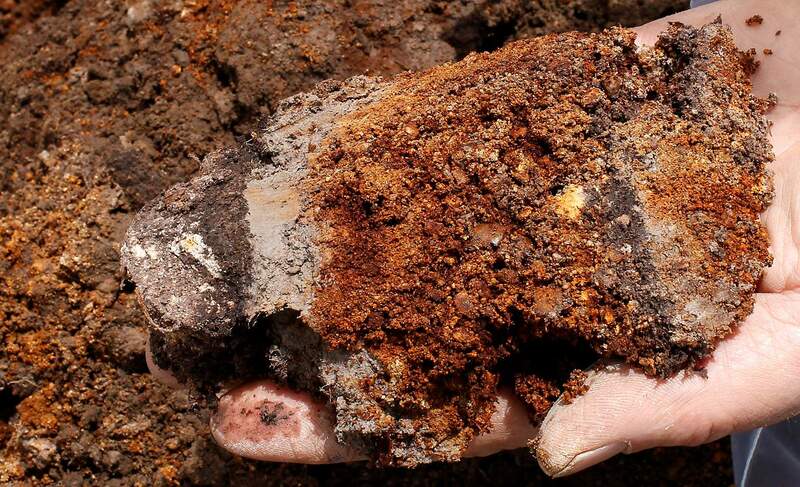 Bill Simon, a co-coordinator of the Animas River Stakeholders Group, analyzes soil made up of, from left, clay, peat, clay, and mineralized soil, in a reclaimed area below the San Antonio Mine in the Mineral Creek drainage. He is trying to understand why plants are growing in some areas and not in others. Bill Simon, a co-coordinator of the Animas River Stakeholders Group, holds enargite (copper arsenic sulfide), which is toxic to plant growth.